This is a relatively simple photography tutorial that will help you to create stunning photographs of the Milky Way galaxy using your current photo equipment and utilizing the image stacking technique. The Milky Way is a spiral galaxy approximately 120,000 light-years in diameter and containing between 100 and 400 billion stars, of which our sun is one. There are billions of galaxies in the universe, which is, hypothetically, one of an infinite number or universes (see multiverse). It is as unfathomable and humbling as it is beautiful. 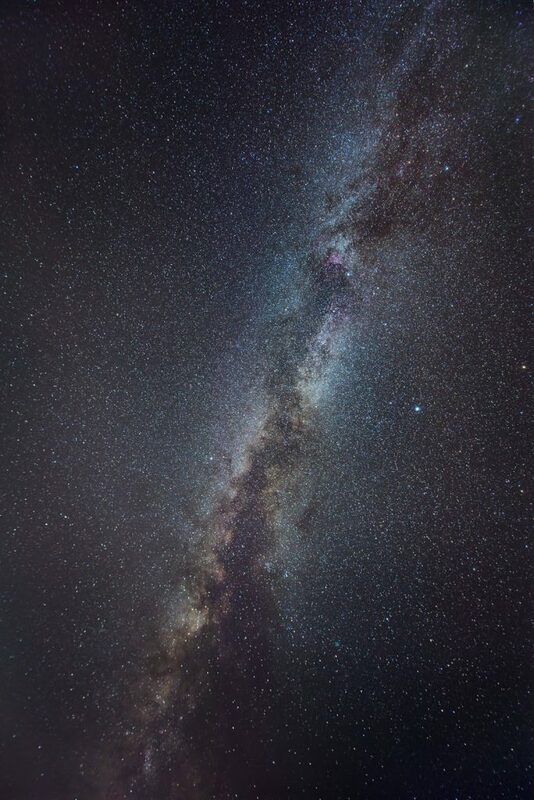 In contrast to my homemade pinhole camera solargraphs, featured here in an earlier post, this photograph of the Milky Way, above, was taken from the same geographic location using good photo tools and completed to the best of my technical abilities at the time. I used a Nikon D800 camera, Nikkor 14-24mm f/2.8G ED lens, Gitzo Explorer Series 2 tripod with Ball Head, Adobe Lightroom and Photoshop. I set the camera to manual mode, turned off noise reduction, vignetting and distortion corrections, set the ISO to 3200, the shutter speed to 20 seconds, white balance was 3600K (modified during post processing), the lens zoomed out to 14mm at f/2.8 and the focus was set to infinity. The images were saved as RAW files. I utilized the image stacking technique to create this photograph. This is when several photos are combined on top of each other in order to increase the signal-to-noise ratio of high ISO images resulting in a cleaner and more detailed photo. Another option for less noisy results would be to decrease the ISO, but that would increase the exposure time resulting in star trails because of the rotating Earth, which is not something that I wanted. Anything above 20 seconds would reveal visible star trails with my camera and lens combination. A third option would be to use a star tracking device which moves the camera in perfect sync with the rotation of the Earth allowing for very long exposures at low ISO. Since I didn’t have one I opted for the stacking technique. It’s important to shoot from a location with minimal light pollution, sadly, something that is increasingly hard to find. Check out this light pollution map to see what I mean. My location was between light and dark green on the map, which is not terrible but could be a lot better. The quality of the results will definitely be limited in urban areas. I used the camera’s built in intervalometer to take a series of 24 photos, one after another. The images are imported into Lightroom for basic colour correction work and exported them as 16-bit TIFF files. I then switched to Photoshop. Under Scripts in the File menu I selected Load Files into Stack… and made sure that “Attempt t Automatically Align Source Images”, necessary to counter the Earth’s rotation over the course of the 24 exposures, and “Create Smart Object after Loading Layers” were checked. Once Photoshop was done processing I went to Smart Objects in the Layers menu and changed the Stack Mode to Median, which is the magic of the stacking technique. The noise was greatly decreased while the details were preserved. I flattened the image and finished with a little more post processing work.